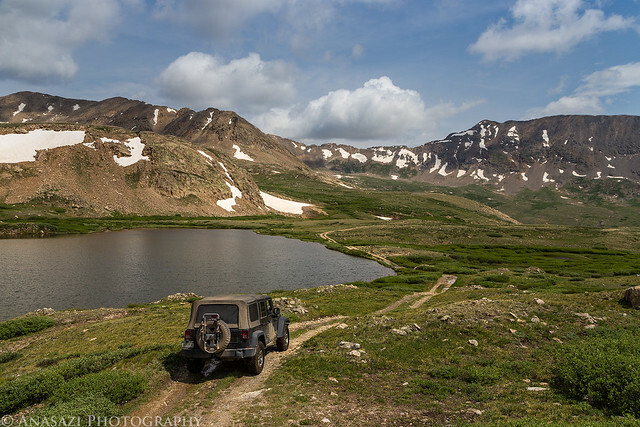 My plans this weekend were to drive over to the Tenmile – Mosquito Range so that I could climb at least one 14er and hopefully a second one, too. I left work on Friday and headed east. 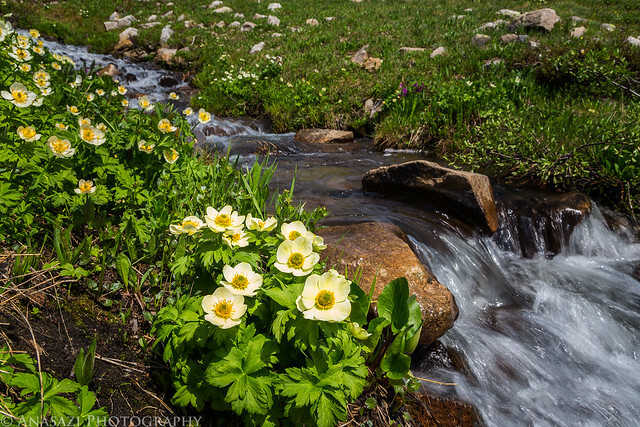 A few hours later I had my campsite setup along Fourmile Creek just outside of Fairplay. 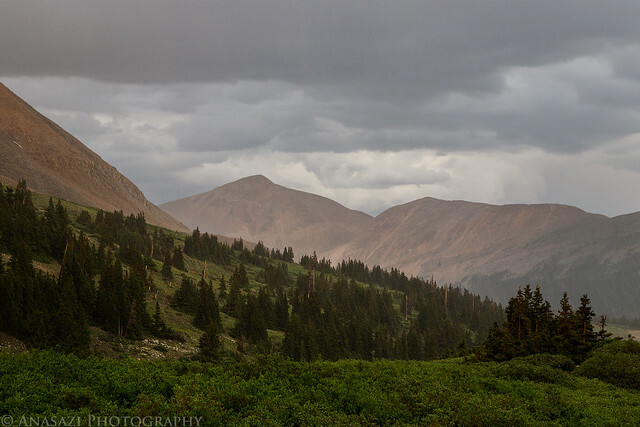 I had a little time before dark, so I decided to drive up to the trailhead for Mount Sherman and check it out. 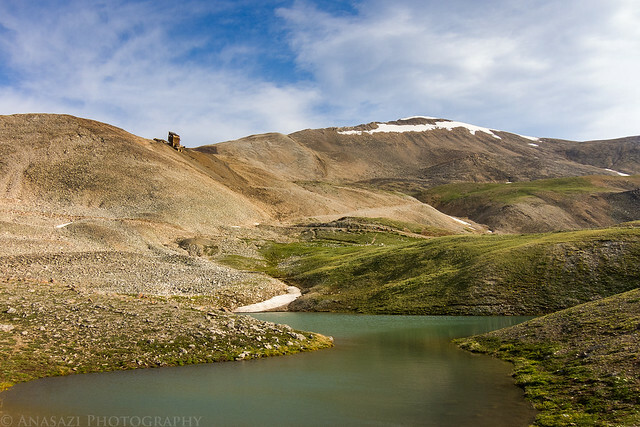 Mount Sherman was my planned hike on Saturday morning. 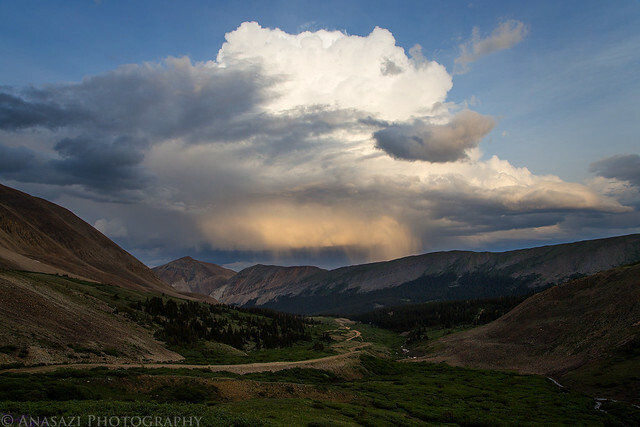 When I arrived at the trailhead for Mount Sherman the distant storm was lit up by evening light. 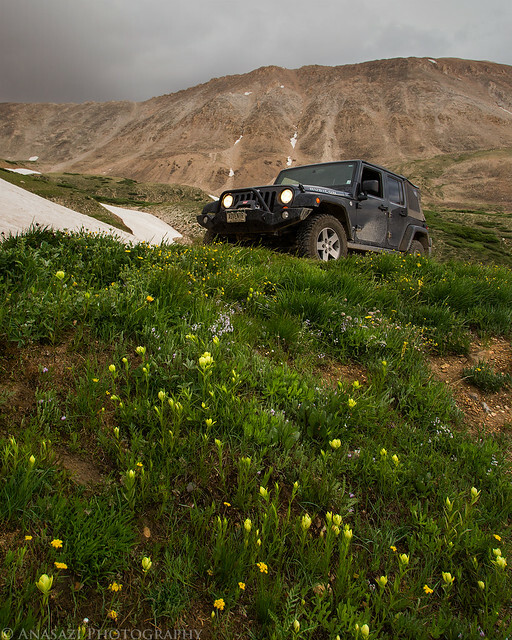 A few wildflowers below my Jeep. It started to pour rain while I was up there. This photo was taken out my window in the storm. 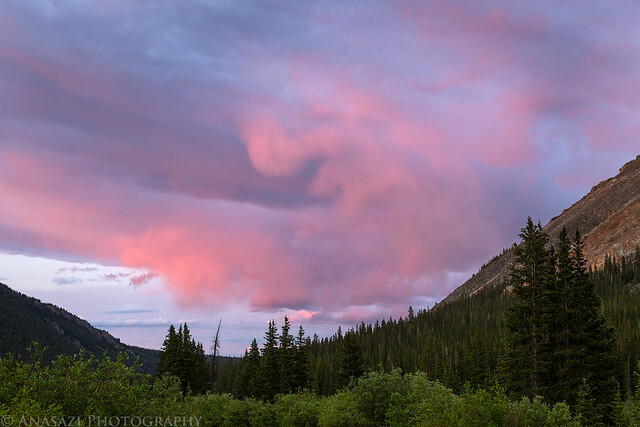 As I drove back down to my campsite, I was treated to a little color in the sky. That night it stormed on and off frequently with heavy rain, lightning and thunder. 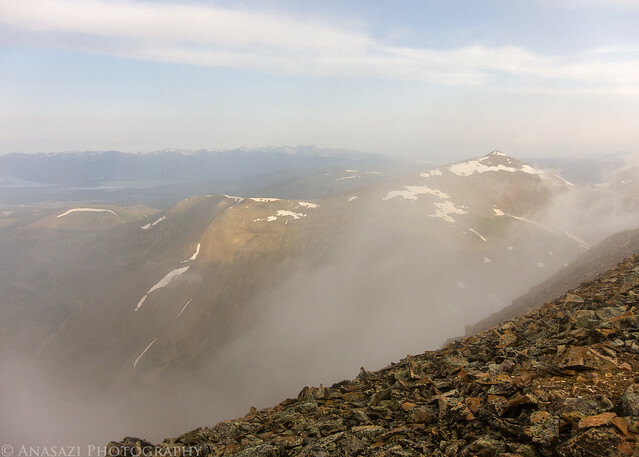 I didn’t sleep very well, so it didn’t help that I woke up at 4:00am to have a quick breakfast and start my hike to the top of 14,036′ Mount Sherman. By this time the storms had stopped, but there were still plenty of darker clouds in the sky. 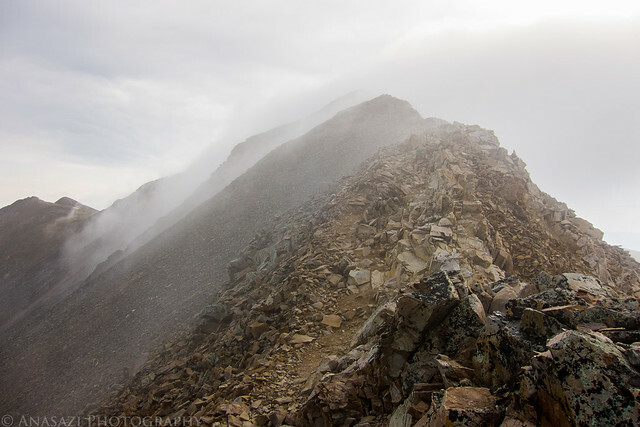 As I approached the Hilltop Mine it was hidden in the clouds. 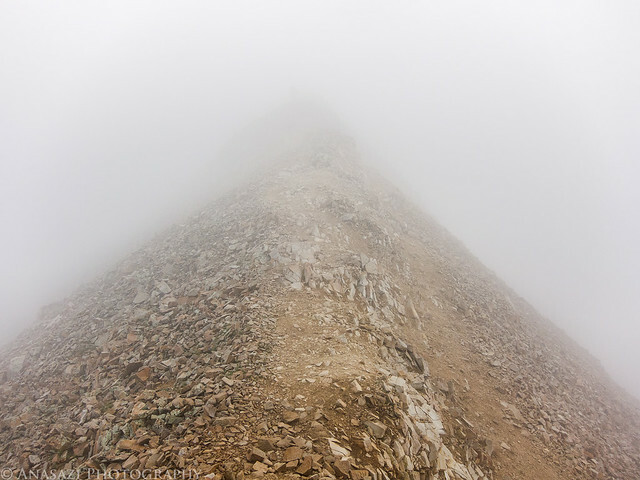 Not much of a view as I followed the ridge up to the summit. 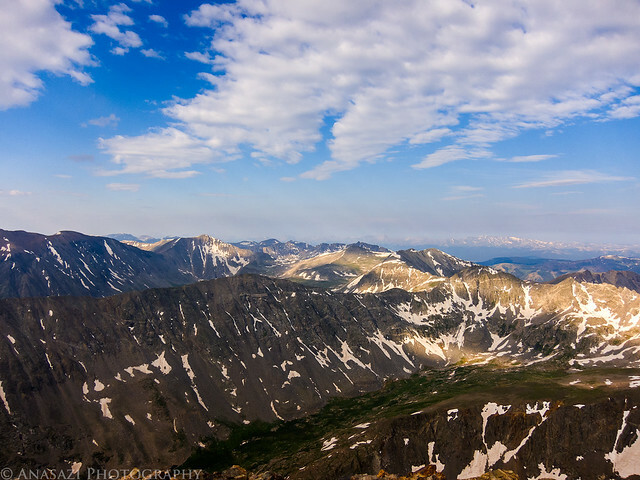 However, when I did reach the summit of Mount Sherman the clouds did finally start to clear out and I was able to get a nice view. I’m glad I decided to make the climb even though the conditions looked iffy. 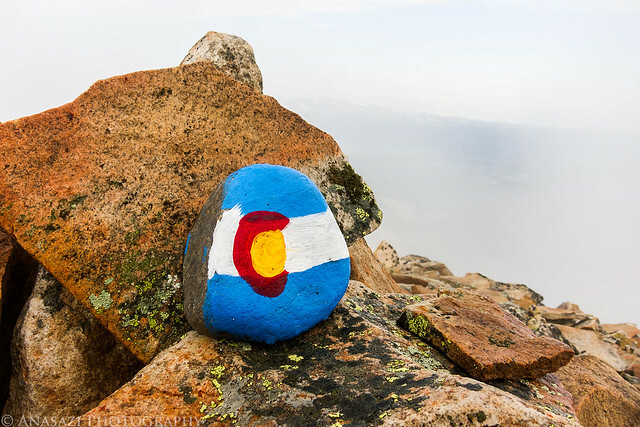 A painted rock found near the summit. Thin clouds were still drifting over the mountains when I started my hike back down. Looking back towards the peak and the ridge I had just descended. 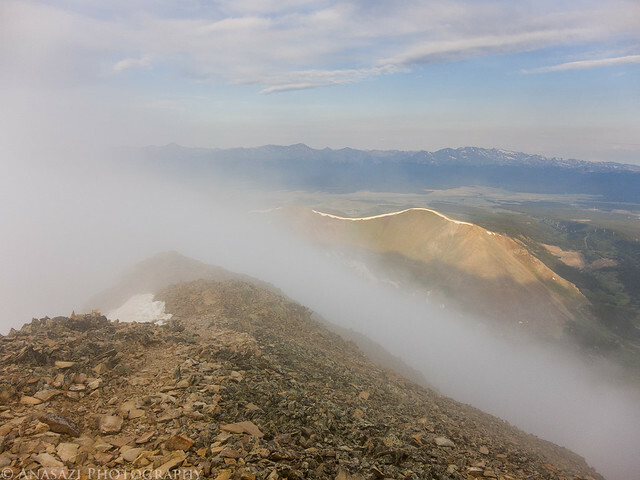 By the time I was almost back down to the trailhead most of the clouds had cleared out. You can see the Hilltop Mine and Mount Sherman above. 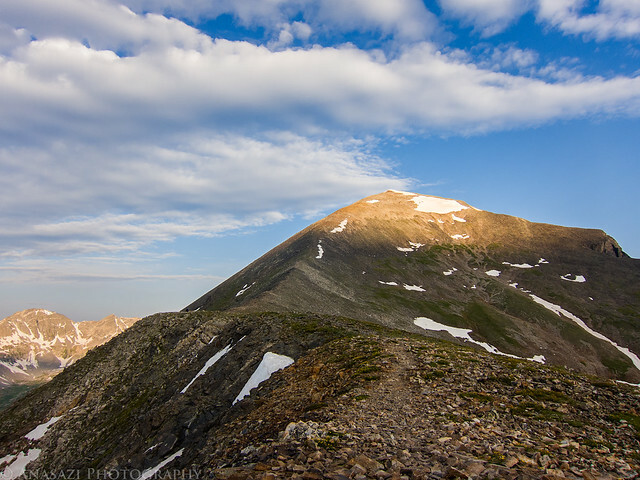 I must say, Mount Sherman is probably the easiest 14er I have climbed to date. I was feeling pretty good when I got back down and knew I would be able to attempt another one on Sunday. 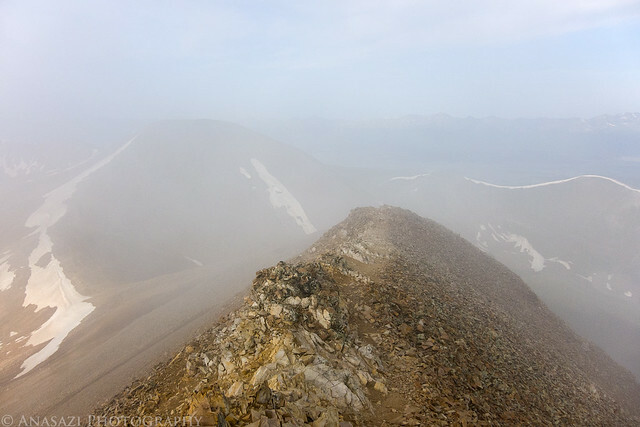 I had hiked to the peak and back in about 3 hours, so it was still very early when I was done. 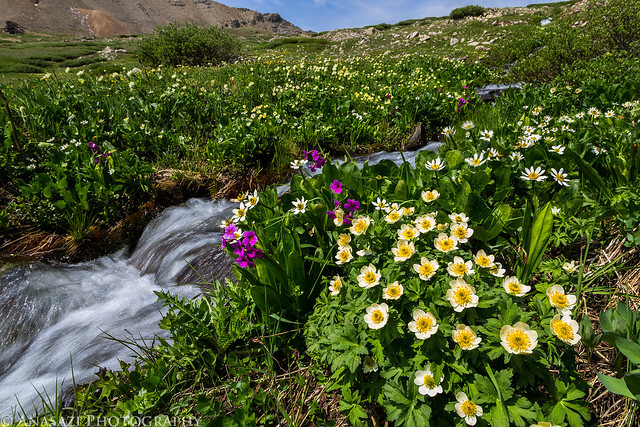 I stopped in Fairplay for a quick breakfast/lunch and then made my way over to the Mosquito Pass Road so I could do a little exploring in my Jeep and search for some wildflowers. 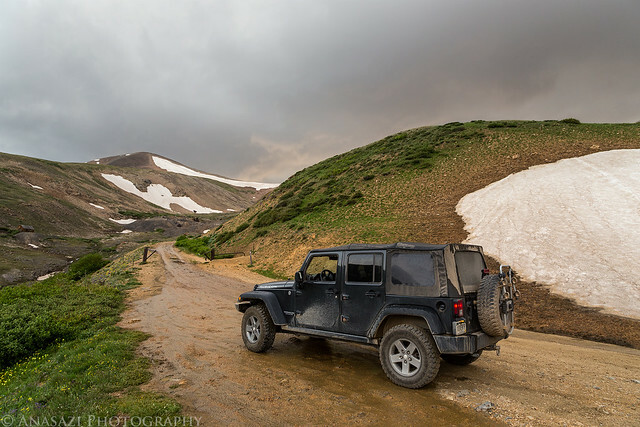 I was hoping I’d be able to make it over the pass to Leadville, but near the top there was a large snow drift that was still blocking the road, so I had to return the same way. 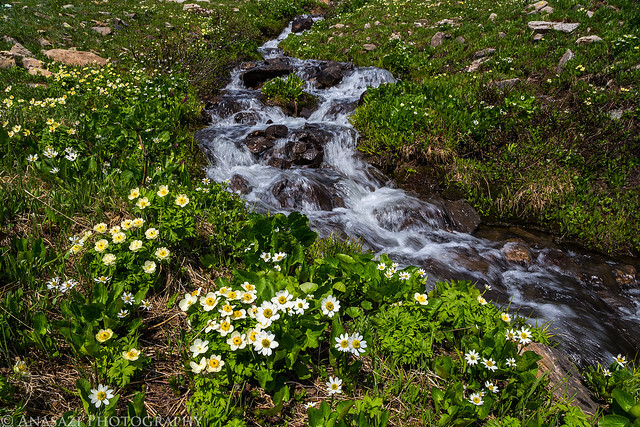 I stopped along a small stream that was lined with wildflowers for a few photos. I took a short side trip to check out Oliver Twist Lake. 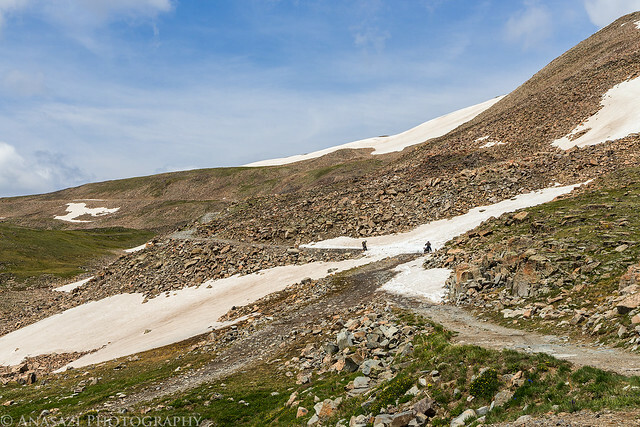 The snow drift that prevented me from getting up to Mosquito Pass. There were a couple of guys on dirt bikes trying to get through. 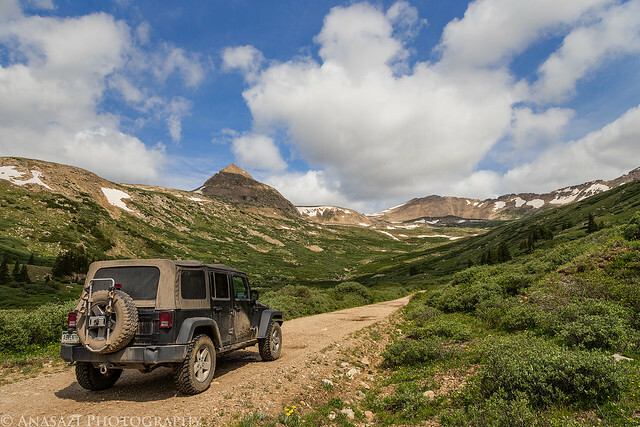 On Sunday morning I was up at 4:00am again and had my camp taken down and loaded into my Jeep in no time. 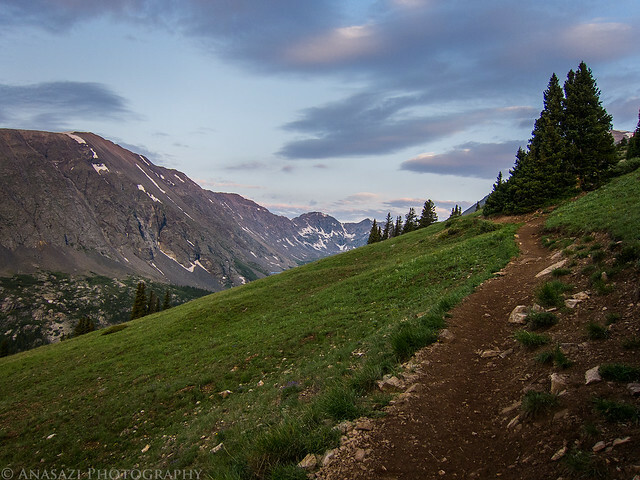 I had a quick breakfast and was the first person at the trailhead for Quandary Peak by 5:15am. The weather was looking much better this morning for my climb up to the top of 14,265′ Quandary Peak. 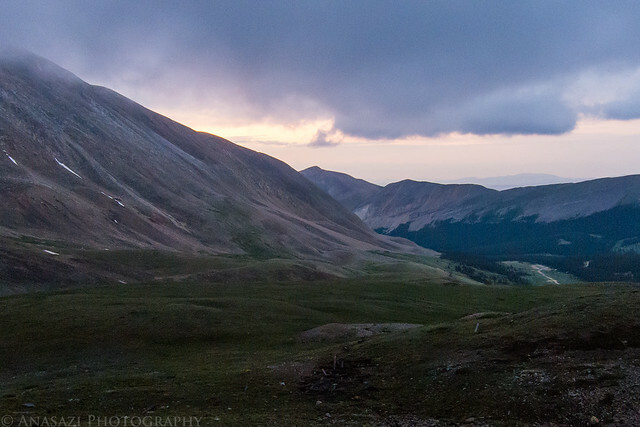 I started the hike in the dark and got to watch the sunrise on the surrounding mountains as I hiked to the top. It was a great morning! 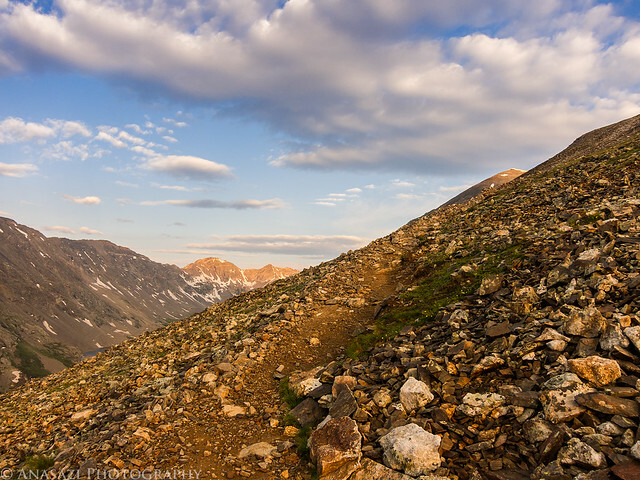 Following the trail to Quandary Peak above treeline before the sun makes an appearance. 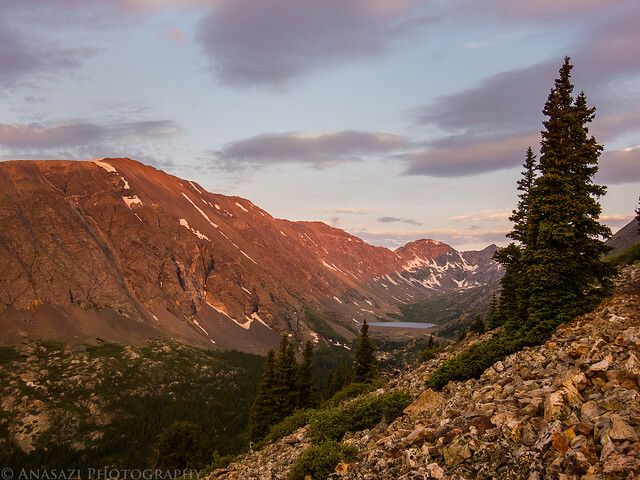 Alpenglow on Wheeler Mountain and North Star Mountain above the Blue Lakes. 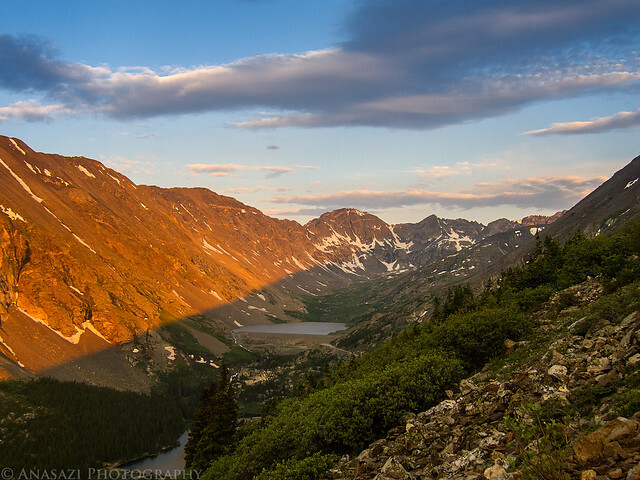 Sunlight on the mountains above the Blue Lakes. Following the trail higher to the ridge. 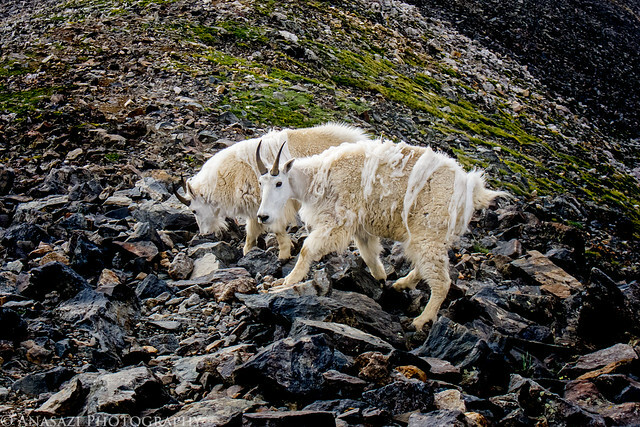 I passed these two mountain goats on my way up. 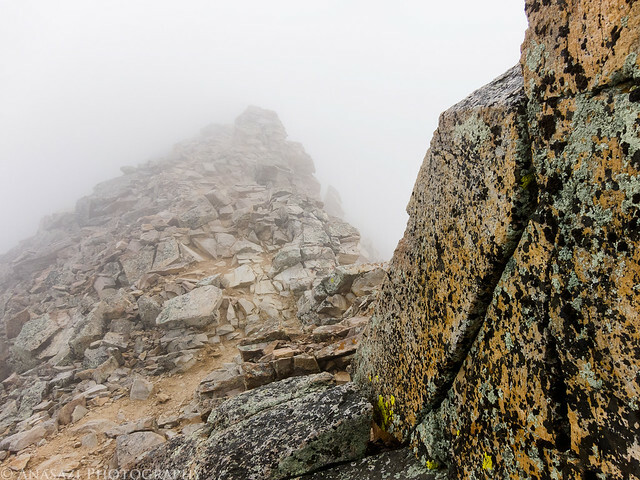 The final ridge to the top of Quandary Peak. Here’s a view from the top. I had the summit to myself, but I didn’t stay long because it was very windy and cold! 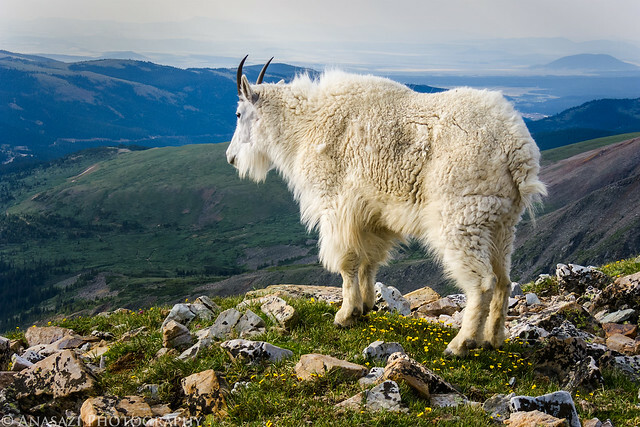 I passed another group of Rocky Mountain Goats on my way back down the trail and this one posed perfectly for me. 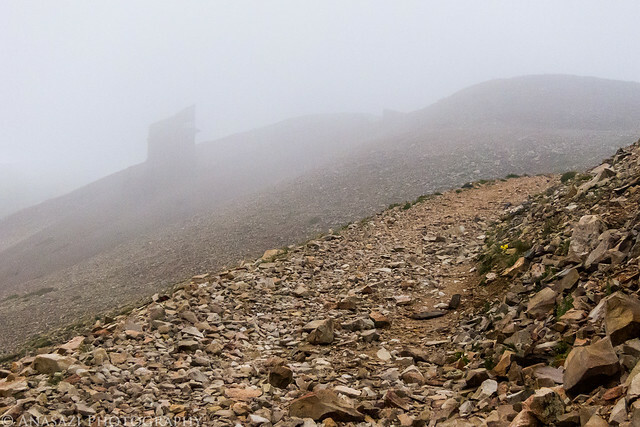 The hike to the top of Quandary Peak was a bit tougher than Mount Sherman since it is a longer hike with more elevation gain, but I was feeling pretty good on the hike thanks to getting better acclimated to the elevation by hiking Mount Sherman the day before. 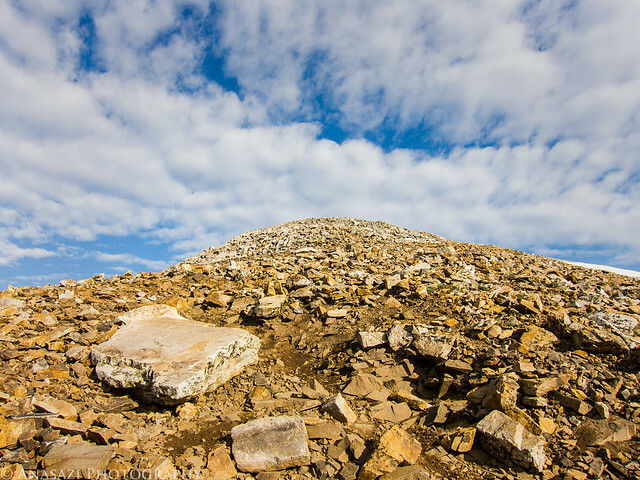 It took my just under 3 hours to reach the summit, but that was with a lot of stops for photos along the way. It only took me an hour and a half to get back down to my Jeep. From there I headed back home to finish off the weekend, with only one stop at GRIND in Glenwood Springs for an excellent burger. It was another great weekend in the mountains!